Like many other comic fans, I've seen a lot of interest in the Spider-Gwen character that was introduced just a little over a year ago. 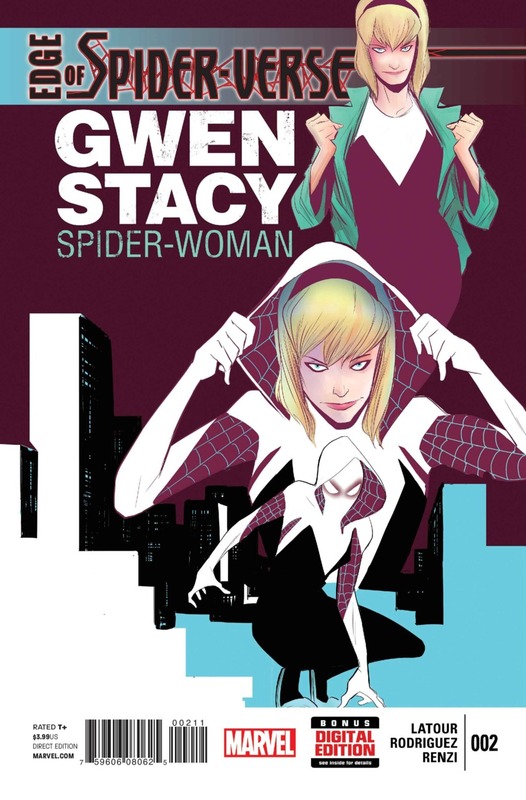 I don't follow the Marvel universe any more, but I'd gathered enough to learn she was a super-powered Gwen Stacy from an alternate timeline that was recruited for some battle along with a bunch of other spider-themed characters across the multiverse. Good on Marvel for introducing her, I thought. It's cool that they've been continuing to introduce female characters that women are able to connect with, and that's proven, in part, by the ton of Spider-Gwen cosplay I saw at C2E2 a week and a half ago. Over this past weekend, I finally read my first Spider-Gwen story. Her very first appearance from Edge of Spider-Verse #2 via the Edge of Spider-Verse TPB collection that was included in last month's Comic Bento subscription. And I was incredibly underwhelmed. Now, granted, there was more depth of character there than Gwen's original appearances, and she certainly had more agency than any version of the character I've seen before, but the story was just... not all that good, frankly. And I don't mean to throw this on Jason Latour and Robbi Rodriguez specifically -- none of the stories in that collection were very good. They were all incredibly predicated on the fact that the reader was intimately familiar with a huge chunk of the Spider-Man mythos generally and the Spider-Verse event specifically. Removed from that context, the stories don't hold together very well. I don't think creators should spoon-feed their readers, but there were more than a few storytelling leaps that readers had to make in order for the stories to make any sense. They may not seem like leaps if you're familiar with the Spider-Man backstory, but things like the whole Peter-becoming-the-Lizard flashback really only work if you know the Lizard character in the first place. The stories aren't really terrible, but that they rely so heavily on shortcuts and assumptions about the readership that they are, at root, bad storytelling. Not to mention some minor, but completely illogical story beats -- a band does NOT go on stage without their drummer, for example. And doesn't Captain Stacy know where his daughter lives -- doesn't the whole "leave before I come to my senses" idea kind of not work at all because of that? I read a piece recently where the author suggested Spider-Gwen's popularity was due, in part, to the character being "unfridged." Her original incarnation was basically just to be a love interest for Spider-Man and die at the hands of his enemy. Though the phrase wasn't coined at the time, she was a poster child for the notion of "women in refrigerators." That Gwen was not only brought back to life, but given power and agency on par with Marvel's signature superhero, Spider-Man, was something that women celebrated. Thus she became more of a stand-out character than other women, like Silk and SP//dr, who were created around the Spider-Verse event. To be fair, Marvel saw the enthusiastic response to Spider-Gwen and tried to come out with more material about her as soon as possible. I haven't read those stories and can't comment on their quality, or what they've done with the character since her debut. But here's where I'm going with this: that women responded so vigorously to a character in a single, short, not-all-that-good story says to me that they are collectively so desperate for any character that has a remote chance of not completely sucking that they're grasping at anything they can. I'm not surprised to the reactions for Kamala Khan and Carol Danvers -- from what I've read, there were some good stories there. But Edge of the Spider-Verse? There's some good ideas there, but not they're not executed very well from a storytelling perspective. I've heard a number of people of color comment how they were thrilled when Luke Cage debuted, despite being entrenched in Blacksploitationism and bad stereotypes, because it was one of the very, very few times that comics even came close to reflecting them on the page. I get that same feeling with this first appearance of Spider-Gwen. The story isn't as cringe-worth as Luke Cage, Power Man #1, but women would rather have something like Spider-Gwen to build on than the nothing they've had before. So despite a few years of a female Thor and a new Ms. Marvel and a new Captain Marvel and whatever, Spider-Gwen's rise to popularity is indicative of just how LOOOOONG a way to go Marvel (and presumably DC, Image, Dark Horse, etc.) has left! Seriously, I'm thrilled Spider-Gwen has gotten some traction, and props to Marvel for quickly realizing they captured something positive with her, but I think the overall readership had to meet them way more than halfway to have Marvel do something actually good with the character.